May I live a life that’s worth copying. * The winners have been selected. Thanks to all who commented. I’ve read every single one and am completely in awe of the kindness in this space. You all encourage me when I need it the most. Thank you. And thanks again to Cinnamon Hill for hosting the giveaway. If you didn’t happen to win you can still order a grater of your own from their site. She follows me into to the bathroom and reaches into my silver and stained make-up bag just as I do. First she watches as I brush a light powder on my nose, by my eyes and wherever else needs a little glow. “I do it all by myself.” She says grabbing the brush from my hands. She brushes away loopy brown curls to make way for the soft bristles that carry with them a fine pink powder. Some fall from the brush and dance around her with the light coming from the window behind. For her eyeshadow goes on cheeks, mascara on eyelids and lipstick everywhere. On the couch we’re tangled up together watching a movie and a burst of gushy love overwhelms as I have one of those, “this is MY girl” moments that happens approximately 3,728 times a day. I cusp her cheeks in my hands and kiss her face a dozen times. Then she turns to me and puts her little fingers on my face and kisses me again and again. “I wub woo too.” She says. In the kitchen I pull my apron off the hook and just as I’m tying it tightly around my waist I hear her bounding up next to me. “Me too?” She asks pointing to her apron that is similar to mine in color and pattern but not size. I attach the velcro strap then she shimmies the stool to the counter eager to help dump and stir. “Gentle.” I say telling her about all the butter tucked into the layers of the croissant dough. She watches me roll the dough then repeats the action with a little less finesse but with just as much joy. When it seems like I’m not watching, little fingers rip at the corner of the dough to get a taste of butter, flour and yeast. Smiling, I say nothing. Together we crouch at the oven, peering into the dirty glass window hoping to get a peak at the rising dough. She sees my excitement and mirrors it with more vigor, a goofy grin and inhaling sharply with anticipation. I laugh at her enthusiasm and my own as we both return our glances to the oven. Even with all her independence she mirrors me and looks to me for how she should act and react. Often this goes unnoticed but the other night as she lay with me in bed and pretended to act interested in watching the Dust Bowl documentary and wiped her nose just as I did and sighed when I did, the weight of this fell on me pretty hard. Ivy, my love, may I live a life that’s worth copying and be the sort of woman that’s worthy of being mirrored. May I humbling admit to you my errors so you can see that real strength shows itself in vulnerability. I hope you see me growing, changing and evolving too. Learn from my mistakes and learn from yours too. Accept them and be, dare I say happy with them because without mistakes there aren’t the lessons learned that are really worth learning. Ivy, I hope you figure out quickly that I don’t have all the answers and I will try not to pretend that I do. I do however, have enough love, wisdom and strength to be your mama and I know that because you are here and you are mine and Someone thinks I’m fit for this position. Thanks for watching me so that I can be accountable to my words. So that I’ll pinch at the cushy layer around my hips less, and quit trying to deny the things I need – like quiet and a little space – because I want you to not be afraid to ask for what you need. And along those same lines I hope you see me asking for help. I’m just learning how to do that and goodness, I hope you figure that lesson out more quickly than me because it’s amazing to be feel loved and those who love you are just aching to help you. Watch your dad and I work intentionally on our marriage. Forget what you heard Cinderella say the other night, because even though you may indeed experience the grace of finding “the one” you need to know that “the one” will disappoint you at times and make mistakes but, little girl, it’s still a fairy tale and real life fairy tales are so much prettier than the movies. Because scabs, wounds and trials just make us shinier. And they give us stories worth telling. Also, don’t ever let the magic of a butter, flour, salt and yeast transforming into a luxurious loaf that we then slather with sticky and tart apricot jam not impress you. Stand at the window of the oven with your daughter, someday, and show her that magic. It’s little things like this that add up to a big life. And finally, thank you. I’m such a better woman because of you, my little girl. Disclaimer: This is in no way related to the “cronut” (the extremely popular and hyped croissant/ donut hybrid) although Sarah has lovingly referred to it as the “croloaf”. I simply refer to it as the best breakfast I’ve had in a long time. I realize that it’s not fair to assume that many, if any, of you have extra croissant dough lying around as I did but my hope is that this loaf will entice you enough to tackle the wonderful beast that is croissant dough. It’s really not as fussy as you may think. I’ve found a couple of great sources here and here for you to see the recipe and process. It just takes time – wait time, but in the waiting flavor is developing, gluten is relaxing and all around good things are happening. This loaf was born out of scraps and then the second one came because I loved the first so much. I adore croissants, of course I do, but the loaf version gives more surface for jam and then think of the possibilities – a blt served between two slices, french toast, eaten alone straight from the pan. So what I have is more idea then straight recipe BUT I also come bearing gifts. 10 to be exact. I was sent the cinnamon grater you see in the photo above from the folks at Cinnamon Hill. I’ve tried grating my cinnamon on a microplane and in a spice grinder with not much luck. This little grater gives you the fluffiest little specks of the most fragrant cinnamon I’ve ever had. It’s so potent that when I let my kids smell it one little monkey bumped the other monkey who then inhaled the cinnamon. There were tears – now that’s fresh. I asked the cinnamon people if they’d let me give out a grater and they responded by saying, “let’s give 10!” Awesome. So comment here and you’re entered. Simple. I’ll randomly choose 10 when I get back from a little vacation next week and then 10 of you will get a lovely little cinnamon grater too. Now, a recipe of sorts. Using the scraps from the croissant dough or just cut strips of the dough, lay a few strips in the bottom of a buttered loaf pan. Sprinkle the layer with a bit of sugar and cinnamon. Continue the layering until the pan is 2/3 full. Cover the pan with plastic wrap or a cloth. Let the dough rise for 1 hour. If the dough was cold this may take longer. Press gently on the dough and when it springs back after you press in it’s ready for baking. It should look puffed but still a bit tight. In a small bowl combine the egg yolk and water and brush on top of the loaf then finish with a bit more sugar. Pre-heat your oven to 400 degrees F.
Bake for 1 – 1 hour 15 minutes. If the loaf begins to brown too quickly turn down the oven a bit. It takes this loaf quite a while to bake through. Let cool on a wire rack in the pan for 10 minutes before inverting and finish cooling. What a lovely post. And what a lovely experience to share your routines in such a thoughtful and conscientious way with a little girl who wants to emulate you. This looks really good, love the look of the croloaf in the pan! Absolutely beautiful post and how precious to have those little moments captured in writing! That loaf is so gorgeous and yummy looking! And I’ve never heard of a cinnamon grater, what an awesome idea! I would love one! I never thought to grate cinnamon before. I’d love to try it out. What a sweet post about your little cutie! That looks delicious and easy! Beautiful pictures! Loaf looks delicious too! I am always looking for new ways to use scraps… although I must admit that I cannot imagine a universe where I would have crossiant scraps around. 😉 So lovely! Makes me hungry! Beautiful words to your sweet little one. Your cinnamon story made me laugh out loud. Thanks for sharing this bright spot in your day! Beautiful post and beautiful pictures. Have a lovely vacation! That looks incredible! I am going to have to try and make this! I’ve never seen such a tool, nor thought of making croissants any other way than the original. Love the ingenuity! What a lovely story. I’m due on Tuesday with a surprise gender baby and hope to be able to value the time with him or her in the kitchen like you do with your little Ivy! That looks almost unbelievably good. Goodness me. If it weren’t approximately 92 degrees in my apartment right now I’d already be on my way to the store! I love the way you tell stories. Beautiful! Beautiful! As the mom of 10, I know the humbling responsibility of being a parent – there is nothing like the joy they bring! Our oldest is 28 and married (with 3 of their own) and our youngest is 4 yrs old – as precious as they are when young, it gets better! So beautiful. And I can’t wait to try the loaf! I am smelling cinnamon in my mind after reading your description. It’s one of my top favorite fragrances. You also made my mouth water with this recipe. Croissant Loaf + cinnamon = YUM! Oh my does that look good! this is probably one of my top three favorite posts you’ve done! thanks for sharing such personal, special moments like this! Such a lovely post! It made me tear up, perhaps because I am missing my little girl who is spending the first full day away from me! The loaf sounds divine! Lovely post! And the cinnamon grater looks so pretty, I was surprised by it when I went back for a second look. What a beautiful post in all ways! Thank you for sharing all of this. Your posts are food for the body and the soul. Thanks for sharing both sides with us. Sitting with tears running down my face reading this – cherish the memories. Oh yes, fluffy fresh cinnamon! I hope I am a lucky winner. Thanks for the beautiful words spoken to your daughter…so true. lovely post; lovely letter to your daughter. and my, that loaf looks incredible! The food looks delicious and the story reminds me of my mother. Thank you for sharing. I think I’ll have to go call her now. what a lovely post, what a beautiful recipe! What a beautiful post, I just love the way you write. I never, ever thought I would want to bake a loaf of bread…then, along comes not without salt! You had me at “croloaf”! Lovely–both the bread & the post. This looks so good I want to attempt the dough! So beautiful! I’ll have to admit though that when I first saw the title of the post I immediately started thinking about mashups – croaf or loissant. I LOLed when I saw the note before the recipe. Ivy is very lucky. Thank you for the post! Well now, that just looks delicious! Those little hands melt my heart! And Ivy sounds like such a curious, lovely, little girl. Loved the writing in this post too, as always. Lovely loaf! I’ve always been afraid of croissant making but you’ve inspired me to give it a try! I have a young daughter as well and can relate to the feelings you’ve written on this post, thank you for sharing them. What a lovely post.thank you for sharing! This sounds perfectly decadent and amazing. Lovely post. As I get ready to have a little one in a few weeks, I look forward to the day when I get to look in the oven window with them and share with them my love of cooking! Oh how I adore cinnamon. What a fantastic tool! so lovely. will definitely make this! Very nice post! I feel like that about my daughters sometimes too. Hope you enjoyed your vacation! Wow, Ashley. This is beautiful. What a brilliant idea to make croissant into a loaf! Definitely will try to make it at home! The croloaf! I love that you remembered. Such a beautiful, beautiful post. 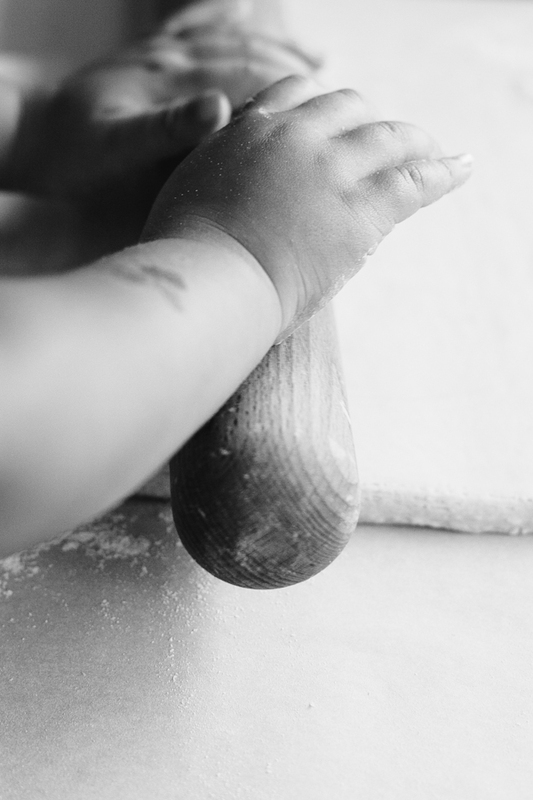 And, I can’t get enough of tiny little hands working with rolling pins and dough. My favorite. Beautifully written. And that recipe, amazing! what a wonderful post – I can’t decide who I think is luckier your daughter for having you or you for having your daughter. may you continue to relish and delight in each other. I am SO HAPPY to have found your blog! I needed some fresh inspiration, and the recipe list is giving it in LOAVES! 😀 (Couldn’t think of a better word- droves just wasn’t right). Your story and your words are very inspiring, I’ve been wanting to try a croissant recipe but have always been a little timid, I think I’ve finally gained enough courage to give it a shot with the croissant loaf! Oh yum!! Croissants are on my kitchen bucket-list. Just waiting for that elusive day when my kiddos aren’t pulling at my pant legs, poking their fingers in the butter and knocking over the flour! How did I miss out on cronuts? Croloaf looks great too! Those little hands! And those dimples! So sweet. Beautiful post. I have a 6 month old baby and am looking forward to cooking with him one day like this. In the meantime I will definitely make an attempt at this recipe! This post brought years to my eyes, so heartfelt. The bond you share with your daughter seems so wonderful, I hope to feel the same when I have children someday! Also, that cinnamon grater? It sounds amazing. I love this story of seeing your daughter and just soaking every little detail in. Such special moments to always cherish. This looks divine. I happen to have some croissant dough in the freezer and may need to try it. Isn’t it, after two (wonderful, extraordinary, entirely magical in all their own–at least in my case–wildly different ways) boys, something else? This girl thing? I welcomed mine into this world, intending to treat her just like her brothers, indeed, doing so for the first year. She had no such plans. She’s a warrior, no princess, but oh my, a different warrior: endlessly observing, mirroring, adapting, sensing, discussing, delighting. They all do, of course. But I wasn’t prepared for this difference. And I am so, so grateful for the chance to bear witness. Pinch those sweet Ivy cheeks for me, Ashley. And HOOT to you for standing up for yourself. Beautiful letter to your daughter. I love your photos. The Croissant Loaf looks delicious– is it as light/airy as normal Croissants? This looks delicious – can’t wait to try this recipe! Couldn’t love this post more! Do you also have yhr croissant dough recipe? What a wonderful thing to see a mother really think through all of those thoughts of daily life and write them so beautifully. that’s so wonderful – and this looks delicious! That loaf looks amazing! I put cinnamon in just about anything I can. Yum! I was just admiring that cinnamon grater! oh how I love everything about this post! I have 3 little boys, and I feel the same about them as you do your little girl. It’s so fun to be in the kitchen with your kids isn’t it? I know I have some wonderful memories helping my Mom when i was little, and she let me do so much so young. I hope my boys will have those same memories with me. What a gorgeous post – I was brought here by the pictures croissant loaf, but kept here on your site by those words about your little one! I’m going to have a good look around, I like your style! Like other above I also noticed the cinnamon grater too, how great to read that you’re giving them as prizes! They’d make a great gift. I may never have a daughter…but your words to your daughter – better write those in ink. Lovely. Time passes so quickly. Enjoy every precious moment. Your daughter will always remember these special times. What gorgeous words *sigh* Oh and that does look like a great brekkie! This was beautiful, Ashley! I teared up reading this and hope I’ll have my own daughter one day 🙂 Keep up the lovely work… in baking and motherhood! You are a brave and beautiful mama (with a beautiful little girl!). Thanks for all you’ve done for me – even if it seemed little to you – and I hope to one day impart a love of the kitchen process to my kids someday, just as you do so very well! What a lovely post about Ivy and you. I enjoyed seeing into your world. I have 2 little daughters too and can relate to the pull of responsibility to show my girls how to live a life worth living- they really do see everything. Thank you for your inspiring comments to remember to share the simple things, honesty, love and passion. I thoroughly enjoyed reading this post and you now have a new follower because of it. I was wondering how and where to get myself one of those cinnamon graters. What a fun giveaway to have! I am expecting my own daughter in less than 6 weeks and I simply cannot wait to share the magic with her. I adore cooking and baking. Thank you for sharing this. Loving on your daughter is such an amazing, wonderful gift. I find myself wanting to write a “love letter” to my little girl. Thanks for “introducing” us to your sweet Ivy. May the mother-daughter croissant making continue for years and years to come. Just beautiful and charming: loaf, story and grater! What an adorably post about sweet “shadowing” by your daughter and bonding time. The loaf idea sounds fantastic and I love the little grater. How I love this post. My daughter is 15 months, and I am discovering more and more each day how delightful and amazing she is. Enjoy your vacation! I loved this post so much, your words and the tiny hands on the dough. Wow! You sure do have a beautiful way with words. I got distracted from the reason I clicked on the link by your writing. This croissant loaf looks stunning! Beautiful loaf, but even more beautiful words about your daughter. This is a beautiful post and a lovely reminder about what’s truly important. Thank you. Ps the loaf looks amazing, too! What a great idea, and very timely, since I’m about to teach several classes on croissant baking, and will have a LOT of leftover croissant dough! What a beautiful loaf. But it doesn’t hold a candle to those pudgy little hands. Precious girl, precious days…treasure them. What a beautifully written blog entry! Though I do hope you print it and leave it somewhere for your daughter to find later in life (even if it’s behind a picture frame in your daughter’s bedroom). I feel this way about my children all the time and often find myself stifling a laugh as they need discipline because watching them learn the rules and break them in such ingenious ways is just so darn amazing. what a sweet and touching story. being a grammy now, I love to hold my grandchildren and give them lots of kisses and hugs. brings back wonderful memories of my little ones too! sometimes I could almost cry with the sweetness of the memories….so a special thanks for that…and for all the good recipes I’ve just discovered on your blog. Lovely pictures and a wonderfully inspirational story. Enjoy your time off and relax. That cinnamon grater is beautiful and I’ve always struggled with properly grating cinnamon (I’ve ruined a microplane in the process!). This looks/sounds amazing! Can’t wait to try! I really enjoyed this post!! It made me want to write a letter to my little girl too! I’ve never tried to make croissants, but I might now! What a gorgeous post and that cinnamon grater looks amazing! Love this post and the beautiful words you penned to your daughter. And this croloaf… it’s stunning! This was so beautiful… Thank you for sharing it wih all of us. Your little girl is very lucky to have you as a role model. Such lovely story and the perfect recipe to have little ones involve. Thanks for sharing. Beautiful post all the way around! I have to admit… the cinnamon grater is the first thing that caught my eye in the photographs! Wonderful post! Thanks to the folks at Cinnamon Hill– love the cinnamon grater! beautiful letter to your daughter and to yourself. it moved me and I am not [yet] a mama. thank you for sharing your heart! That’s a neat looking grater – I don’t think I’ve ever tried anything but a coffee grinder for cinnamon. What’s not to love???? So beautiful! I am intrigued with attempting this recipe with the help of my 3 1/2 year old kitchen helper. Especially if cinnamon is involved as that is his most favorite ingredient to add to all recipes, necessary or not. Beautiful words, beautiful baking. My mother is strangely gone (Alzheimer’s), but baking with her is part of my fondest memories. Thank you. Your post brought tears to my eyes. I also have a “I do it myself” girl, who watches my every move (and loves to help in the kitchen). What a beautiful reminder that we are their model and the importance of that. The recipe looks wonderful too and the grater looks just fab! I’ve never attempted to croissant dough but this sounds so good that I’m willing. Love special kitchen gadgets–latest is my nutmeg grater–and would love to add the cinnamon grater to my cache! This recipe sounds amazing, and a cinnamong grater, who knew!! I use fresh cinnamon is most of my baking because I like the spicier sweets! Thank you for the loving story and wonderful recipe. Such a great post!! I would love a cinnamon grater, I can’t even begin to imagine how much brighter the flavor would be with fresh cinnamon. Extra croissant dough is a lovely, lovely thing! Aw, so sweet! Love little moments like that!! My husband makes fresh jam with local marionberries every summer. I can envision using the croissant loaf with the berries for a delicious breakfast or an afternoon snack. Thanks for the deep reflections. I have a little boy but the sentiments are similar. I want to be the woman that teaches him to love and respect the people in his life, to work at relationships, and to accept himself. What a wonderful post! And the loaf looks amazing. I love a good croissant. The cinnamon grater looks like a very handy gadget, and looks like it would be good for nutmeg too. Thanks for the inspiration. I am bound and determined to learn how to make croissant pastry dough. Aww …. This is soooo cute. My sister has a 5 year old son and she constantly has those ‘This is my son!’ moments. If she leaves her kid to go to the grocery store, she has to come back, put him in her lap, and give him a thorough hugging/kissing to make up for lost time. This made me tear up a little thinking of my little girl. She’s only 8 months, but I already see her trying to imitate her mama. Your post brought a lump to my throat as I remembered baking with my two girls, now young women, and how they copied me sometimes, too. I hope I was a worthy example for them to emulate. I never thought of grating my cinnamon, though I do it with my nutmeg. Thanks for the post. I now have grandchildren that stand beside me and peek through the dirty oven window…your post – especially the photo of your daughter’s chubby little hands – brought tears to my eyes! Beautiful post! Enjoy every minute. What nice pictures you posted. I love having my grandbaby help me bake. I have sooo many baking gadgets in my drawer, but I have never seen a cinnamon grater like this. How cool it that? I am always pleasantly surprised by your insight. Thank you for sharing as this is so true about daughters. Try as you might there are things you do that you realize you don’t really want them to learn. 🙂 I am always striving to be a better mom, stopping to take a breath before replying to the 50th request for something you have said No to 49 times already! Your thoughts are a blessing. I love this post on so many levels. I also have a 2 1/2 yr old daughter (and a 6 yr old daughter) and you said what I feel everyday in such a beautiful and eloquent way. I really truly love this. and the croissant loaf looks delicious! Sweet sweet letter to your daughter and a tempting enough loaf to consider tackling croissant dough! I’m a little over 6 weeks pregnant, but I’m pretty sure that this post would’ve made my heart swell and my eyes fill even if I weren’t full of hormones. Fingers crossed that I’ll be able to greet motherhood with the same sense of responsibility, gratitude, and wonder that you’ve expressed here. Oh what a precious and beautiful post! And yum, that croissant loaf looks delicious! Wonderful post – yummy recipe. I might not wait for the oppressive heat and humidity to ease before attempting this!! What a lovely post. Something your daughter will cherish for years. The loaf looks amazing. May just have to tackle the dough this Fall when I have more down time. Summers are sooooo busy. Such similar thoughts and feelings I have had about my daughter who is now all grown up. I still hold her face in my hands. I still kiss the curl at the nape of her neck. I treasure a photo I have of her at two years of age, hair wrapped in a towel, kneeling on my vanity chair, applying “mommy’s lipstick”. Her passion for baking has grown with her years, and some of our most treasured moments now are when we are together in the kitchen stirring up something sweet and delicious. Love this post! You always have such beautiful pearls of wisdom to share. The croissant loaf looks incredible, can’t wait to try it! This looks so amazing! Beautiful photographs, too! Ivy is such a lucky girl to have you for her momma! Thank you for sharing & can’t wait to try this croissant dough! Your post today really touched me. I have a teenage daughter and miss those days that you describe. I still pray everyday to be a good mom and role model. Thank you for such openness in your blog and for the amazing recipes and photos. The times we share with our children are the most beautiful and I think most of us would want to say the same thing to our daughters. Looks delish! I love your blog. Thank you, as ever, for the inspiration. Many of your posts leave me welled up with grateful, joyful tears and a renewed determination to take notice of the beauty that surrounds us. Oh my that looks amazing. I have a deep love for croissants. … sounds and looks divine, the story, so sweet and the cinnamon grater, a classic design in wood – thank you! I must make this for brunch, it looks so yummy. Goodness gracious this is lovely. Thank you for such a beautiful post! It brought tears to my eyes as I have two young daughters if my own. The loaf looks amazingly yummy. LOVED your beautiful words! I was just thinking similar thoughts about my 9 year-old daughter this morning. She is growing up way too fast and I am doing my best to cherish every moment and to model to her the type of woman she can be. Thank you for sharing! Thanks for the reminder, as moments before reading this, I was overwhelmed by the “mama, mama, mama”, coming from my son. Wow, this looks absolutely wonderful! I can guarantee that this would be the epitome of a brunch dinner with my family, who love soft buttery croissants. When my sister and I were little, my mother used to toast them up the day after and spread butter and jam over the top, which would then melt into a heavenly berry sauce. Can’t wait to give it a go on actual croissant toast! Beautiful words and a yummy treat. This looks wonderful, and love seeing those little chubby hands helping! This croissant loaf looks absolutely. divine. It looks like I’m really getting caught up in this cronut fad because I just want to make everything croissant now! love your stories, maybe even more than the receipes. I love your posting — your daughter is a lucky girl to have a mom who cares so much. This post is so sweet, you are a lovely mommy :). Wow what a great post, I hope one day that I have a little girl I can have those moments with! Oh my, what a lovely post. I teared up with joy just thinking of the future ahead of me. My little girl is 9 months now and I can’t wait to be able to cook and bake with her. Watching her grow is the greatest gift! The words of so many say it all. Beautiful. Sweet. Unforgettable. Poignant. Touching. May we all have memories such as these to savor all our lives. Thank you. Lovely post…I always look forward to your words in my in box. Wondering about the store bought croissant dough myself….cinnamon is my favorite!!! Your love for your daughter brought tears to my eyes. I am so glad that you are writing more! I love the idea of grating my own cinnamon. I have a sweet little 6 month old and I can’t wait until we can cook together. A cinnamon grater??! How cool! My roommate is from Vietnam and she always brings back giant, beautiful cinnamon sticks after she goes to visit. What a wonderful expression of love for your daughter! And what a delicious looking loaf! Thanks for sharing. What a beautiful post, and a fittingly beautiful recipe to pair with it. Croissant french toast – now there’s a tempting idea! I’ll definitely be pinning this for later. A beautifully written and moving story and an inspiring recipe. I can’t wait to make this. oh my, what a lovely post. i would love that grater! i always get stumped with what to do with my cinnamon sticks so this would be perfect. Something everyone should keep extras of – croissant dough, you never know when you might need it. I love the idea of a blt between two slices of this. Will definitely be testing this out soon. In honor of your touching post, today my 3-yr. old baking buddy and I are making peach-blueberry cobbler with cinnamon (and a bit of nutmeg). He’s a maniac with a biscuit cutter – must be all that Play-doh practice! Thank you for making me think about how much our children do watch us… Beautifully written! Lovely post. I am insanely jealous of your mama/daughter relationship…. but I try to instill the love of ingredients and cooking in my three boys. I hope to succeed, and this gives me inspiration. Thanks for sharing your lovely thoughts AND a delicious recipe!! YUM!! Been reading your posts for a while, this is my first comment- beautiful touching words to your little one, and a great recipe idea…thanks for sharing. Such a beautiful post… I love you images! Such a beautiful written piece to wake up to as I lie here in bed smiling at the interactions between you and your 2 1/2 year old daughter. That will be a spectacular read when she is older. I am now craving croissants and think the cinnamon grater is amazing! All the best. What a lovely post, and a wonderful idea for leftover croissant dough scraps! Just beautiful all around. I loved loved loved this post! It is so sweet how you wrote your daughter a letter and your encouragement is so wonderful. That cinnamon grater sounds amazing as well! I’ve never thought of cinnamon as fluffy, but it sounds delightful. Beautiful tool. Fresh really is best. Thanks for all you do. I searched for “homemade bitters” and came to your article on the subject, which fits well with my style of food craft. Then, out of curiosity, I tapped the title of your site where I enjoyed reading your most current post. A recent microplane purchase will not be used for cinnamin. Thanks for that tip. first time on your lovely blog – and this entry here is how I knew I would love it. Beautiful post! Love croissants and the loaf sounds wonderful! I just want to say that croissant loaf is genius! Such a lovely post, thank you for sharing these beautiful thoughts with us. This is gorgeous! I would love if the actual croissant recipe were part of this recipe as well though. Can’t wait to try this out! Thank you for the wise words on parenting. I have an almost-one-year-old and I thank you for the timely advice. found your post through pinterest. My littles love to do make up with me. Such a beautiful and handy kitchen tool. Thank you for sharing your life, recipes and fabulous giveaways. …this reminded me of baking pies with my 2 girls…how quickly time flies…so glad I have so many pictures of my memories in the kitchen with them and a close relationship with them both…glad to see you are doing the same! I make a twisted chocolate babka with croissant dough. Next time I’ll try layering it. Beautiful! I didn’t even know a cinnamon grater was a thing. This is beautiful. Baking is such a joy to share with people and you’ve captured this perfectly. And such a beautiful cinnamon grater! I want croissant loaf too!! Thanks!! That grater is so beautiful! I know what you mean about not being able to grate cinnamon on a microplane or in a spice grinder – I’ve been eating more cinnamon bits than cinnamon powder, lately. That looks absolutely delicious. It’s funny, like so many things there are certain recipes that you feel overwhelmed by UNTIL you try them. Always assuming a level of enthusiasm, but it isn’t hard, just a little patience and the results absolutely so delicious! The grater is delightful, before even reading down that you are generously giving away some, I was thinking I must ask A where she got that! Just lovely! The little doughy hands rolling the croissant dough are so sweet. Amazing breakfast idea! I cannot wait to try this for my next family brunch! And what a beautiful grater! How delicious! I have never tried making croissants before but have always wanted to; this recipe may be a perfect reason to start doing so! We make a brioche loaf that I enjoy more than regular brioche for the same reason — more surface for butter and jam! Your cro-loaf looks terrific. awesome post. I have 3 daughters and 4 granddaughters. I passed this post on to them. 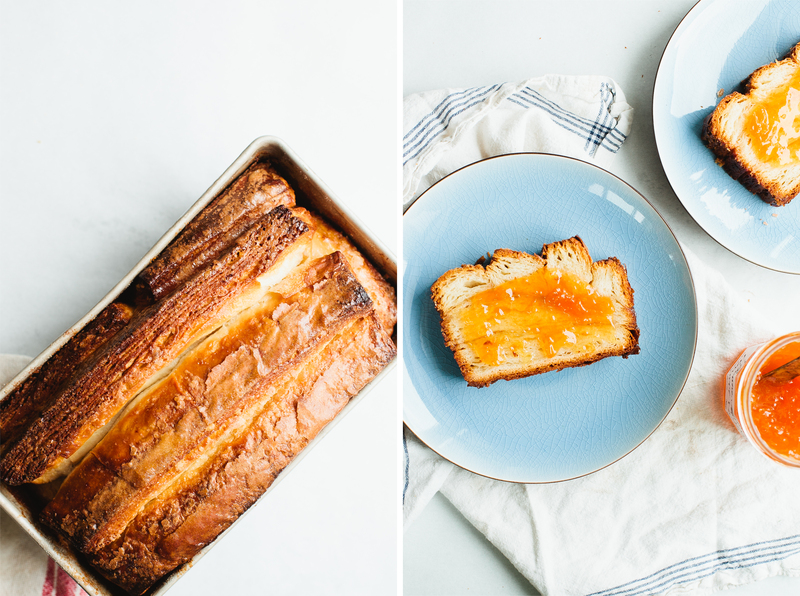 great pictures and great recipe as usual… I love the idea of such a confy and sharable breakfast loaf! I would love to be able to grate fresh cinnamon! What a useful gadget! The loaf looks wonderful, I can’t wait to make one! Lovely pictures and writing. The weather is finally cool enough again to turn on the oven. Maybe this will be the first baking project. Brought a tear to my eye. Nothing like baking with the babes….and so eloquently stated. Thanks for sharing. My husband loves cinnamon and sugar toast. I can’t wait until he tastes this. It looks wonderful. I go through tons of cinnamon; I use it ut alot of my cooking & baking…I even put it in my pasta for spice sometimes! i learn a lot from your blog. i look forward to each new post and i’m always excited to try something new. my next project (inspired by your lard rendering post) is to find a local farm to purchase leaf lard and experiment with lard recipes. anyway, it’s quite a lot of fun to read. thanks. What a beautiful post…and an amazing looking loaf. I can’t wait to try it! I could barely read this post due to the tears welling in my eyes and spilling down my cheeks. I am counting the days until I stand at the counter with my sweet little Lucy Joy by my side. She has a very special Swedish cookie to master now that she is the fifth generation of women privy to the family recipe. Beautiful writing, beautiful family, beautiful recipe. Thank you. I am now going to attempt to read it properly, tissues in hand. I clicked over for a recipe but found a thoughtful post and such a lovely description of motherhood. Thank you for that, and the delicious recipe. This looks absolutely delicious! Another inspiration to finally tackle croissant dough! Lovely account of your relationship with your daughter. I so envy you (in the nicest sense of the word, of course!) having a delightful 2 1/2-year-old. I love her pretended interest in the Dust Bowl documentary (which I recently watched as well). And what’s not to love about a croissant loaf, I ask you! Lovely use of dough scrapes. That looks amazing! You’re increasing my courage to try croissants myself. What a beautiful story! I look forward to moments like those with my daughter, now seventeen months old. that loaf looks so good! Nice! Makes me want to tackle croissant dough again. Love the words to your daughter. Such a beautiful post reminding us that who we are and how we live is directly reflected in our children. Thanks for such a lovely post that re-inspires me to cook AND write. how refreshing to read such a well-written and thoughtful blog. merci! As a new mom, this post made me cry. I’m so excited to share the love of food and baking with my little guy. The recipe also looks amazing. It may be time for me to finally try making croissant dough! What a beautiful post! And this loaf looks amazing! How great a cinnamon grater, and I will have to try the loaf it looks fabulous. Such a sweet and darling post! I’m in France now, home of the croissant, and will share this recipe with my French cousins, who I’m sure will love it! This looks fantastic! next time I feel like making croissants I’ll have to try this instead! Oh, my. My husband would LOVE this! That looks amazing. What a perfect breakfast for my boys. Thank you for sharing. Your recipes look delicous, I can’t wait to try them! This post is touching & those chubby little hands, priceless. The recipe sounds great. I am a cinnamon lover. That breakfast loaf would be wonderful with a pot of tea on my front porch as the sun comes up. all I can say about this post is that it makes me long for the day when I will have a daughter to teach the joy of watching butter, yeast, and flour turn into something truly breathtaking. thank you for posting! I love what you want to tell your daughter. I have a little girl too–although she is too young now to try to imitate me. But if she starts to, I will remember this post. When I first saw that cinnamon grater in the picture, my immediate thought was, “wow, I need one of those!” (having just discovered how much better freshly grated cinnamon is). Then I saw that you’re doing a giveaway! How great! Sweet post- I too have a 2 1/2 year old. It’s a magical time, for sure. He goes through my spice cupboard all the time, and says , “Mummy, can I smell this one…and this one?” Cinnamon is a big favourite! 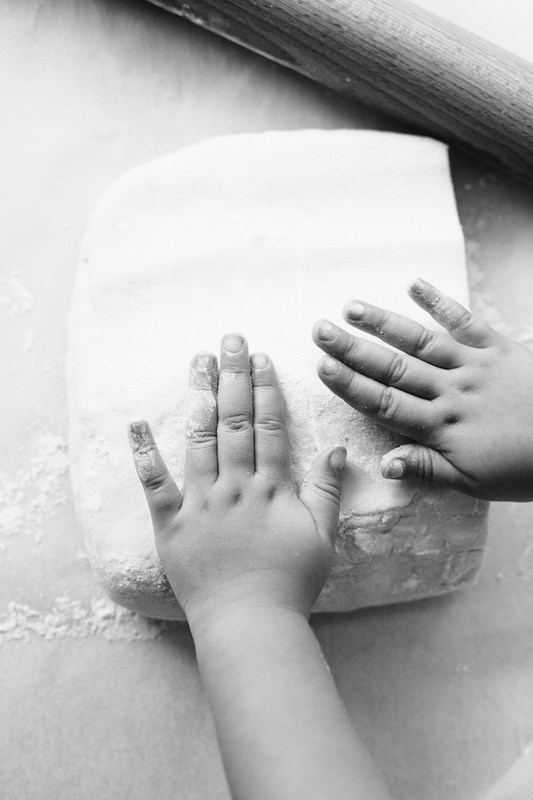 The dearest photo of little hands and the rolling pin…. and the bread looks wonderful too. What a wonderful thing to read at the end of this weekend. I need it, and I need to make this loaf. And I NEED cinnamon grater. this is gorgeous — every part. So tender and eloquently written. That cinnamon grater is gorgeous. I would love to win one and grate my own cinnamon for this croissant loaf. Oh…my, yes, it’s time to make that dough again. 🙂 Thanks for the inspiration. I think to turn this loaf into sandwich bread is genius! Loved this post. Will look forward to a few vacation photos of the gorgeous little trio. Yum! Looks way better than the cronut. fantastic post. i enjoy baking with my little finneus, too. there’s something special about sharing the joy of making something wonderful from the simplest of ingredients. thanks for posting and the inspiration to try and tackle croissant dough! hope to win a cinnamon grater, too.. very handy little tool. What a lovely idea for leftover croissant dough, love it! That is the first thing I noticed in your pictures — the cinnamon grater and was going to ask where you got it! What a wonderful surprise to see that it was a giveaway. Awesome. This post was so sweet, and the pictures of your daughter’s hands rolling out dough might be the most precious thing I’ve ever seen. It sounds like you are such a good Mama, and creating some great memories for your daughter. I would also love to win a cinnamon grater, as I don’t have one, and now feel it is necessary that I recreate this croissant loaf, since it almost moved me to tears. Thank you for sharing! What a sweet post…that grater is nifty! Love the story-and what a delicious looking bread! Such a lovely post. I have a little boy but these same thoughts go through my head when he burst into giggles if I laugh, and pats the counter when I do. These littles are so precious. This bread looks delicious! Anything with the word crossiants, and I’m sold. Beautiful letter, and beautiful piece of equipment! Oh my, I’m not sure I could give up croissants after making the dough, but this does look tasty. what a great looking recipe! I think I’ll have to try out crossiant dough now. I’d LOVE LOVE LOVE a cinnamon grater!! Bread looks amazing! Oh my goodness! I would so love to have that sweet little grater – and maybe, just maybe, I’ll tackle your croissant dough, since the weather is finally cooler. This was a beautiful and moving post. I’m no mother yet but it makes me ache with the love I know my mother has perfectly modeled to me. I also hope I can do the same. While reading, I was admiring that little grater; what luck to see that it is the giveaway! Love love love croissants… can’t wait to try to make my own! What a sweet story, thank you for sharing it! The cinnamon grater looks so much more pleasing to the eye, and to the touch, than my hard edged metal (too long) micro planer that I’ve been using. More than that, I have been pondering your letter to your daughter and enjoying those sentiments so much. I have a 17 month old and think often of bolstering narratives. I really enjoyed yours, thank you for sharing. Looks so yummy! Fresh grated cinnamon over our oats in the a.m. sounds so good! Loved this post. Important points to convey to our children and all those we encounter. And I can’t wait to make a croissant loaf. I have never seen a cinnamon grater. Too cool! Such sweet sentiments. I really enjoyed reading this post and seeing the beautiful pictures that complement both your words and your baking. That loaf looks amazing. And a cinnamon grater is just what I have been looking for – perfect for my mom’s crumb cake! What an interesting concept…croissant loaf. Oh, and the cinnamon grater is awesome! Lovely! I love your letter to your daughter, and the loaf looks delicious! Thank you for sharing your love letter with your daughter. This could be my husband and our 3 boys…the way they emulate their father is just wonderful. He is humbled by it. That was a lovely post! And the loaf looks amazing. An amazingly sweet sentiment and one I surely share. Cannot wait for some croloaf with my little assistant. I would love a cinnamon grater… Can it be used for ze nutmeg?? You’re a beautiful writer! Your telling was so tender. I have a grown daughter with 2 boys and a 2 1/2 year little girl. You are building precious memories for you and her alike. I just happened upon your blog and fell in love with your recipes and techniques. I love to bake. I’ve always tried to include my grandchildren in that happy mess as well. We have created some special memories ourselves. Thank you for sharing your heart! Yum! And what an interesting cinnamon grater! What a lovely piece, it made me tear up a little and thank my almost 2-year-old for making me a better woman too. You make me wish I had a little girl! OMG killed by the tiny baby hands. Too cute. I love the name Ivy! That looks delicious, and love all of the pictures! Love the story, pictures and brilliant use of croissant dough. Something to look forward to one day..
Beautiful bread and post. Thank you! I’ve never made croissants before but I definitely need to make this loaf!! this post has my name written alll over it.. yummy!! I love cinnamon and I bet fresh grated would be awesome! Not going to lie- croissants from scratch scare me, but this loaf looks amazing! YUM! why have I never thought of croissant loaf?! genius. I have to make this for my older daughter’s sandwiches…so much better than trying to slice a regular croissant! Freshly grated cinnamon? Sounds delicious. Your writing style and photographs and recipes are all pure divination. I just adore relishing over every word and this entry was made extra special by the fact that I could so clearly remember myself by my own mother’s side at Ivy’s age. I love sharing my kitchen with my grandsons! Oh my got to make this soon. I was drawn in with a croissant loaf. I have an enormous love for croissants and am determined to try them any way possible. But I couldn’t stop reading as I continued to hear about your daughter and the relationship you two hold. It’s an incredibly beautiful, treasured thing. Thanks for sharing. That’s the most adorable grater I’ve ever seen! Cinnamon, Sugar and Dough are my 3 favorite things. Thank you for making my day! What a fantastic post! You are right, real life is better than fairy tales and it is only because of the scrapes and bruises that we know just how good life is. Gorgeous post and seems like a great tool! My original thought as I started reading is “OK, where is the recipe?” but loved the description of what we need to do to live well and become a person we don’t mind having others model. Then I read the recipe and went through the links of recipes and the cinnamon information and came away knowing I want to make a croissant loaf, and I want to keep reading your blog. Not many have made me as interested in what they are saying as you have today. What a sweet post. I have two little girls of my own and this really hits home! A beautiful little grater it is! When my kiddos were little, I always tried to remember that I was training adults, not just raising kids. Thanks for the chance to win that darling grater! The loaf sounds great! I love cooking with my daughter and teaching her new things. It’s a wonderful time. The loaf is beautiful and impressive but it’s this post that made me stop in my tracks and brought a tear to my eye. It is so great you are willing to share all these deep thoughts. While I still make memories with my mom, this post made me want to be a little girl again to have those special moments. Oh my goodness. This looks divine. I really have to try this sometime soon. Beautiful! The loaf and the microplane! When we recognize that our children want to be just like us, it’s certainly a game changer causing us to reflect on the sort of person we want them to become. I love your croissant loaf! I have a daughter and 5 grandaughters and I do remember those feelings though I have never seen them written so eloquently. You sure know how to put words to evoke memories, thank you, I think your daughter is a very lucky little girl. I too have tried everything to grate cinnamon with no luck. Could you tell me where to purchase the grater, love fresh cinnamon in my coffee, not to crazy about chewing on tiny pieces of bark. The pictures of Ivy’s hands are sublime… You are an amazing mama. I’m now very tempted to tackle croissant dough… And such a beautiful story to go with it! I absolutely love hearing about your little helping hands – I can’t wait for my son to get a bit more coordination so our adventures in the kitchen are a little more productive! I also can’t wait to try this recipe for my mother – a huge croissant fan! Love..love the thoughts communicated to your daughter about “gentle” and how this corresponds to your following wise words to her regarding on-going marital respect and “work” on making one’s imagined fairy-tale husband (or life!) worthy of continuous patience and attention. Recent, impressed follower of your blog…Superlative plating, imagery…and of course…well-written prose and tutorials! Thanks for existing! I love it! And do not own a spice grater. This would be perfect. Thank you for this beautifully written story and recipe. This might be my favorite of all of your posts . . . And that’s saying something! I love the window into your world and the sweet snippets of your little twosome. Happy summer to your beautiful household! Oh my! This looks delicious! I would love to make it using a new cinnamon grater! Enjoy your vacation! A croissant loaf…genius! Beautiful, too. This looks delicious! I have a question about slicing this loaf – does it just shred? I love the idea of croissant french toast, but can’t image the fine layers standing up to much, so I was wondering how the texture turned out? Regardless, this is on my to-do list for the weekend! Love that she loves it as much as you do AND the photos of the hands on dough. Thank you also for getting me ready to tackle croissant dough again…. I had just about given up. Such a beautiful note to your daughter – I hope one day she can read it and look back and can remember those lovely days she had with you. Lovely post! 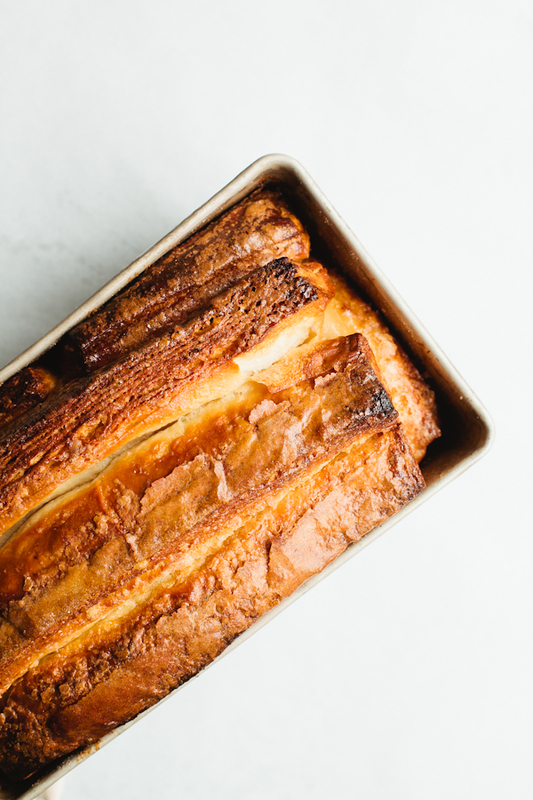 And croissant loaf… genius! Thanks for sharing. Croissants are a staple in my kitchen and I can’t wait to try this variation! I need to do more baking with my kids! Some days it just send like so much more work tho! Neat cinnamon grater! As a new mom to a 2 month old baby girl, your post reminds me of the weight and importance of my role and leaves me excited for what is to come. Now I just need to find the time to make croissant dough! I cherish my daughter too. I can only dream of one day being as selfless of a mother as you are. Your honest self-reflection is truly courageous. Thank you for being brave enough to share this post with all of us. This is absolutely precious. Thanks for sharing! What a sweet letter to your daughter! It’s so crazy to think that all of us are role models to these tiny people in our lives. P.S. This recipe sounds amazing. I think you may have just given me the cajones to try to make croissants and then this loaf. Merci! Yum. I can’t wait to try this recipe. Love that your little girl loves cooking too. Oh gosh, this is the first post I read of yours and I cannot wait to read more. Delightful! my husband and i love your blog. your recipes have inspired several date nights in the kitchen. can’t wait to share our love of cooking with our future children. Gorgeous bread. I can’t wait to try and make some. french toast and bread pudding. This looks delicious and the writing about family and love and responsibilities makes it even better. I also liked the links about recipes, etc. including clicking and learning so much about cinnamon. I couldn’t agree more about everything said in that post. I cannot wait for the day when I get to cook with my own little precious one. Great recipe also! lovely and poignant. cinnamon is one of the best scents! Your letter to Ivy made me cry – my own little girl just turned one last week. Thanks for sharing your heart; I can’t wait for your book! Your words are so beautiful, so inspiring. I’m not a Mom yet, but posts like this always make me look forward to having a little one call me Mama and copy my every move. I would love to have the cinnamon grater. My kids LOVE cinnamon on their hot cocoa and I always have the hardest time with my microplane. I will have to bite the bullet this summer and try croissants. My two men (husband and son) will love you to pieces (and hopefully me too) if this works. I am all for making cinnamon easier to grate. Thank you for a wonderful website. What a neat post! The loaf looks delicious and beautiful:) And I too have problems grating my cinnamon, what a useful tool!! Making me so very hungry! What a lovely sentiment, to show your daughter it’s more than ok, it’s admirable to work on a marriage, ask for help, and be imperfect. You’re a wonderful example I hope to follow some day. I love pretty much all things bread and cinnamon. This is such a great way to have both. A while back I took the Craftsy class on croissant making. Unfortunately, my timing was off and it is too hot in Texas to be doing that right now. Hurry up fall! Meanwhile, I’ll keep getting my daily dose of cinnamon at breakfast. Your relationship with your daughter warms my heart. She is so sweet! The bread looks so flaky,golden and yummy. I’ve read your blog for a little while now but never commented. This post brought heart felt tears to my eyes. It may be that I am 38 weeks pregnant with my third child but your words were so lovely. I would like to almost word for word say this to my 5 year old daughter. You have inspired me to write something to her now that she may read later in life. Thank you. ALSO the bread looks amazing and thinking about fluffy specks of the most fragrant cinnamon makes me smile! Thank you for sharing! Heartwarming story! Would love a grater! This “croloaf” looks DELICIOUS!!! I can’t wait to try the recipe this weekend. Having a little girl has drastically changed the way I view myself and women. What beautiful words to your sweet girl. Gorgeous! I know what’ll be on my breakfast menu this weekend…. I have never seen a cinnamon grater before, it looks really cool! Lovely story as well, sweetly written. Thank you for the great giveaway! You have such a unique way with words. I am currently in Panama for the next 4 months far removed from those I love and reading your blog has become something reminiscent of comfort food to me, reminding me both of my loved ones and the foods, produce and kitchen gadgets that I love. Thank you for this thoughtful and beautiful post. I’m obsessed over the cronut (reading about it all over the internet, that is, since I live in the midwest, no chance of tasting that in the near future), your recipe seems like something I would actually do (no frying needed!). And I’ve never seen a cinnamon grater before, so thanks for the giveaway! Wow, that sounds delicious. I *DO* happen to have some croissant dough laying around, and will try this soon. This makes me want to tackle croissant dough – amazing! What a treat for my eyes and heart. Thank you for the delightful read, the stunning bread and passionate story. Also, that cinna-grater looks something kinda nice. This is the loveliest post (as was your last). I am getting married in a month and I cannot wait to be a mama and I will remember and hold dear these words. Thank you for your beautiful writing. (And the cinnamon giveaway, too. But mostly the beautiful writing). Well, THIS recipe is certainly going in my end-of-wheat-break file. Probably at the front, between “Persian Love Cake” and “Grilled Pizza”. YUM. Thank you! Beautiful recipe. This is my first time finding your blog and it’s already a favorite! That looks so delicious! I’ve always wanted to try making croissant dough but have never gotten around to it. This looks worth the effort though! Delectable sounding recipe! I must try it. Your posts are always such a feast for the eyes. Thank you. I usually don’t find myself reading the journal parts of food blogs very often, but yours is charming and engaging. Thanks for the resources on croissant making! I tripped across your blog via Pinterest and have added your RSS feed to my reader. Loved your piece to/about your daughter. My four year old Ruby loves to need our Sunday morning biscuit dough. You brought tears to my eyes. I tripped across your blog via Pinterest and have added your RSS feed to my reader. Loved your piece to/about your daughter. My four year old Ruby loves to kneed our Sunday morning biscuit dough. You brought tears to my eyes. I’m going to make these right now!! Amazing! Love this post.. now wish I had some extra dough lying around! I loved your little story. How cute is that? And the recipe sounds amazing. I am a mom of 2 young boys and already they share the same love for cooking as I do. My 3.5 year old loves making breakfast with me. His favorite is making biscuits. I’m super excited to try your croissant loaf because I know he’ll love the rolling and folding of the dough. Thank you for the beautiful inspiration. You’re writing is beautiful and the bread looks delicious. I would eat croissants for every meal if I could. Love the grater too! What a lovely story about you and your little girl. I’ve been realizing recently the ways in which I’ve copied my Mother without thinking about it. I don’t mean saying phrases she does, or “becoming my Mother” stuff, I mean like that I wear make up to go on a date or go to church (and only then) because that’s the only time my Mother did. Also. I love croissants. Ken’s Bakery makes really, really yummy ones; so much so I haven’t yet learned to make my own … maybe for croissant loaf. I love the way you photograph your meals and the little moments in-between start to finish. I aspire to photograph with the same care, devotion, hard work and love you pour into each image. Anyone stumbling onto your pages can tell immediately that you are a woman who love her craft. The cinnamon grater is a lovely idea too, I hope your little monkey recovered soon afterwards. What a lovely letter to your daughter. Thank you for sharing. I LOVE LOVE LOVE this post… I don’t even have kids yet but this one is worthy of printing and saving, as a reminder. Well said and heartfelt and a great reminder of the little things we often miss. Thank you so much for sharing. ANd the recipe/loaf looks divine, I will have to find a way to have some dough left over to try it. Wish I had some for breakfast this morning lol. My, oh my. A croissant loaf. I am dreaming of a warm cheese & prosciutto sandwich now. I also really loved your letter to your daughter. I am trying to embrace the idea that stating my needs and saying sorry are two of the most important things I can do as a mom. This is such beautiful, perfectly worded sentiment. Thank you for sharing this lovely, quiet reflection with us. What a lovely post…makes you think about how much your everyday moods and acts can affect others, especially kids. And this is a yummy looking recipe for sure! Hello! My name is Jess, and I run a food blog called Floptimism where every week I write a post called “Weekend Wrap Up.” Basically, it’s where I highlight some of my favorite web finds from the past week to share with my readers. I loved your idea for a croissant loaf so much that I featured it on this week’s wrap-up, and wanted to let you know. Thank you for such a great idea and blog post! I’ve included the link below in case you’re interested. I hope you had a great weekend! This bread looks amazing! I can’t wait tn try it. Thnx for sharing! Wpw! Love the recipe. Love the post! I love the photo of the toddler hands on the rolling pin. Precious! What a gorgeous grater! My mouth is watering at the mere thought of a croissant loaf. Or twenty croissant loaves. What a great childhood you’re providing to your daughter. I’ve been meaning to make my own croissant dough again. Lovely post and delicious-looking loaf! Mmmm!!! looks amazing!! and sounds even better with the addition of cinnamon inside! ahh!! love cinnamon in my tea, and what better way to have it with a cinnamon infused croissant loaf as well! You’ve solved a problem I’ve had about all those scraps! Thanks! I am definitely tackling this recipe! I have never made croissant dough, but am game to give it a go if I can have this lovely loaf in the end. Ivy is a lucky lass to have you as a mum. Just discovered your blog and don’t plan to leave any time soon. Lovely. And the cinnamon grater is a thing of beauty in itself. What a loving legacy you are giving your daughter. And this recipe? It may just be the perfect incentive to give croissant dough a try. Just so I can make a blt with it. Can’t you just imagine it with some thick sliced, pepper encrusted bacon? Yum. I’m here ’cause Lebovitz shared your post. Love this space of yours. Now I’m having breakfast with a rhubarb crumble, but for tomorrow morning this loaf is my goal! too much salt, and too little flour. and nudging them into a vague roundness. I did these all by myself, right Daddy? were smoothed into shape behind my back. From Love and Other Collisions (Press 53, 2010). Lovely story. It reminds me so much of my own “this is MY girl” moments my daughter … but as she is approaching 2nd grade and becoming more and more independent, I have to be so much more intentional about our time together now. You write beautifully (and you must be something of a genius to create a croissant loaf). Mmm. Wow! I have some croissant dough in the freezer! I’ll have to try this! Why haven’t I’ve tought of something like this before? Must be because I haven’t got extra croissant dough lying around. Being a big fan of things like pull apard bread and everything with a crusty and flaky dough, I think I’ll give this a try after the heathwave passes us over. i love what you have written to Ivy!!!! so important and right….may both of you find more reasons to love each other more and more…..
What a lovely post. Thank you for sharing your thoughts and this gorgeous croissant loaf with us. Do you have a recipe for croissant dough? I didn’t want to follow from another site cause I have had disasters trying to combine diff elements of a recipe from different sources. Help pretty please? I would love to bake this tmrw. What a lucky little girl. Your post makes me want to bake with my niece! Love it!! My 3 year old son loves to cook with me and nibble the edges off raw dough too! Looks like a great team project! Gorgeous post about your daughter. Wow. I have two sons so it’s a little different, but then again not. I still want to be a good, honest model for them. Thank you. How beautiful! I’m sharing this with one of my friends who has a year-old daughter. Isn’t it funny, we’re the ones who are supposed to be teaching our kids, yet they teach us so much! Thank you! This looks like a special loaf sold by our local grocery store when I was growing up. It was absolutely incredible toasted and I’ve barely tasted anything as delicious since, outside of France. You can also sprinkle the layers with sliced almonds and a bit of sugar. Lovely, lovely reflections about your daughter. That grater is the coolest thing ever! This is very beautiful, and a wonderful story about cooking with family. Thanks for sharing. Lovely post about family time and growing up…..and I love that you call them “the cinnamon people”. what a sweet daughter you have, and how lucky she is to have you as a mom! great post – I wish I had some of this right now! this bread looks like heaven! and it makes the idea of making croissant dough less daunting, because you don’t have to cut and roll for individual croissants! love it! beautiful loaf, beautiful grater, thanks! Simply awesome recipe. I too am dreaming of some kind of prosciutto sandwich between the slices of this loaf. Thanks so much for keeping up all the great recipes! This has reminded me of two things- 1, to be less critical of myself because my little girl is also watching every move that I make, and 2, that I need to make croissant dough. It’s been on my list for a long time, but your “croloaf” has given me that little push. Can’t wait! lovely! 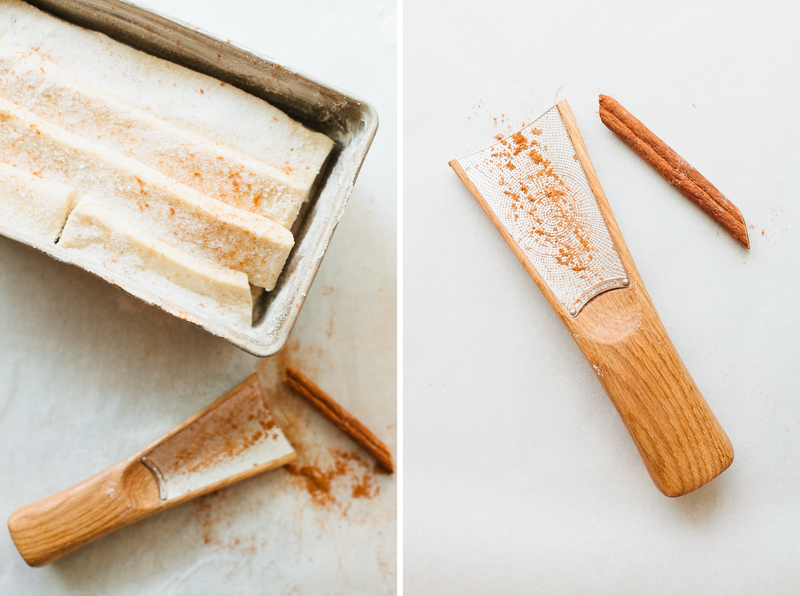 what a great cinnamon tool! This croissant load is such an excellent idea! I can’t wait for a cooler day to get on with my lamination. I’ve never seen this little tool before! So fun to see the gadgets that can so enhance flavor and experience. This was the most wonderful food blog post I’ve ever read! (perhaps because I love to cook and am pregnant with my first child–so the storytelling of your relationship with Ivy made me swoon). Thank you! it’s a beautiful little grater! lovely story. such a beautifully written post. i’m inspired to live wholesomely enough and deeply enough to share similarly precious moments with my children in the future 🙂 thank you so much for sharing. Beautiful post 🙂 I just discovered your blog and I’d love to try this recipe!! What a sweet story! I have an 8 year old and she loves to bake as well and try to help. This loaf looks scrumptious! Thanks for sharing. Your blog is a great inspiration. I’m currently in my first year of marriage and have started “dating” my husband; it really does work. Thank you. I was about to say that even if I am not a cooking blogger, the food pictures from my last entry to by blog are nicer that in any posh cooking blog, including yours. MMM! this looks so good! I may be far too late for the drawing, but nonetheless, I want to say you are a wise woman and mother, and the photos of your daughters hands are wonderful! love the pictures but the story is what got me….I love it! Such a wonderful post for your daughter to look back on when she is older! Your blog is always a treasure to read, but especially today. I just discovered your blog today, and I love it! How did I never hear about you before?! this sounds like a cool gadget! I’m feeling so misty eyed over your post right now! My 2 year old and I had such an on and off day, from melty whines to the biggest kiss-fest we’ve ever had. He keeps me in check constantly and had definitely made me a better person. Those little hands in the photos are inspiring me to include him in my own baking endeavors! This really is a beautiful post and I am sure the loaf really is the most wonderful breakfast! The only thing stopping me from baking that is my determination to lose weight. Ashley, I love you posts about date night, and your honesty about the difficulties we all face in relationships. It always encourages me to be the best person I can be in my own relationship. That looks amazing…wish I had a loaf sitting here right this second! Not only did that post make me cry (im kinda a sap) but the ‘croloaf’ looks amazing!! i may have to try this out. Love the grater especially since my little one LOVES cinnamon on everything. My friend Rachael (food blogger from Set the Table) suggested I check you out. I just read this latest post and I look forward to reading more and sampling your recipes. Thanks! Oh dear inhaling cinnamon…that must be painful (but oh so delicious smelling). My daughter has been begging me to figure out how to make croissants at home. You have inspired me! Croissant loaf is genius. Little cinnamon grater is beautiful and awesome. I love beautiful effective tools. Crossiant scraps? I always eat them! Those pictures really are beautiful. Might try this one. Great post. Love this. Croissant dough and cinnamon is just delightful. Might try this one! this brought tears to my eyes. such a beautiful post. thank you! I am not quite sure how I stumbled upon your blog, but I will be staying…your writting about / too your daughter in the post is beautiful, powerful and very moving I wish I could say things as eloquently about my two girls. I’ve always wanted a cinnamon grater!!! Thank you for sharing yourself here. I tripped upon this through Pinterest, and must say that this is one of the most lovely things I’ve read this year. May your family be blessed with a lifetime of moments and memories like this. I was just wondering if I could use ready-to-bake croissant dough and just line them up that way? I don’t think I’m skilled enough to make my own croissant dough so maybe I could take a shortcut until I figure out how to make a good homemade croissant! Do you have the recipe for the dough itself? Looks yummy… I have a special place in my heart for my daughter too! Looks so yummy! I have a special place in my heart for my daughter…who I share the love of food with. What a beautiful blog! I found you through Pinterest…and now I’m a follower. There is nothing sweeter than those chubby little hands. Just adorable. Your post brought back many sweet memories of baking with my daughter when she was little. She is all grown now. (22!) You are a wise mom. I made croissants and had a lot of scraps (from making the “precise triangles”) that I didn’t want to dump. I too thought of making a loaf out of the scraps but I did not know the right temperature to bake the loaf..I am glad I found this post! THANKS! I will definitely make this again..turned out so well! Where is the recipe for the croissant dough? Thank you. It’s such a fun and rewarding process!